Home made butter with home made cream & desi ghee !! 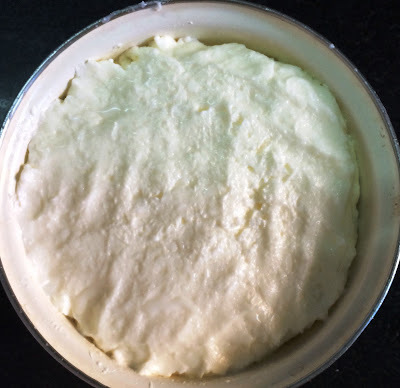 A very simple method to prepare white butter & flavourful desi ghee !! How to prepare yogurt at home ! Boil full fat milk. Cool it & keep in refrigerator. A thick layer of cream is formed on the surface of the milk. Like wise I store daily cream formed over my 2 litres of the milk in fridge. When sufficient cream is collected ( from about 6 litres of milk ) add 2 tsp of yogurt or 1/4 th cup of butter milk in the cream. Keep it overnight. Cream yogurt is formed in the morning. Churn it with hand whisker ((wooden ravi). I preferably prepare with my wooden whisker. In 5 minutes you will get butter over the cream. Add cold water & take out the butter in a heavy bottom pan if you want to prepare ghee. I get about 1/2 kg of butter out of this cream. You can use the tasty butter itself or prepare ghee out of butter. Keep the pan on gas stove on low flame. In 15 minutes you will get nice aromatic ghee. Liquid below the butter is butter milk. It is very healthy & tastes yummy. In a pot take about 1/2 litre of warm milk. Add 1 tsp of yogurt & mix properly. Keep the pot in warm place. In mumbai I get thick yogurt in 3-4 hours. Adjust the quantity of yogurt in the milk as per the season & place where you are living. So you can prepare Butter, Ghee , yogurt &Butter milk everything home made, pure & healthy.